We purchased Gidget from BellBorne Farm at the Private Collection Auction in 2008. As I examined the auction animals, I was WOWed by the fleece regrowth that Gidget was exhibiting - it was extremely fine, dense, and has these beautiful ringlet curls uniformly across her body. Gidget was shorn before the auction because she was too hot and uncomfortable. Her first blanket was 3.6 lbs, with an annualized shear weight of 8.2 lbs - no wonder she was hot! Olympia is a real sweetheart! She arrived at 21.8 lbs, and hasn't stopped growing. While she was only 10 months old at her first show, she was one of the biggest females in the juvenile class. She has above average bone and size, and will be a great foundation female. She has a very nice personality, and will stand while you pet her and pick up her feet. She likes to be petted! 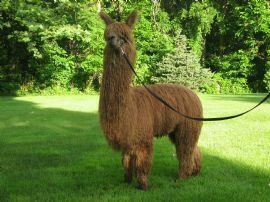 Her color is gorgeous - a very uniform medium brown from tip of her ears down to her toes, with wave and a twist locks. Beautiful luster, too! When you touch her fleece, it feels like melted butter and makes you want to keep touching her. Her dam is Icon's Golden Girl , aka "Gidget on the farm", a beautiful dark fawn by Lost Creek's Black Icon, who produced many winning black foundation dams for Wilkin's Livestock. She is a major fleece producer and shears 7 lbs per year, with a 3.25-3.75 lb blanket. She is also holding fineness and luster in her fleece. Olympia's sire is the well-known Macgyver's Balboa, a true black herdsire who racked up 12 Championships and was considered "unbeatable" for many shows. 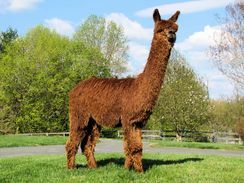 His offspring garner many ribbons and championships and he is well-respected as a top-producing herd sire, with the good chance of producing black. 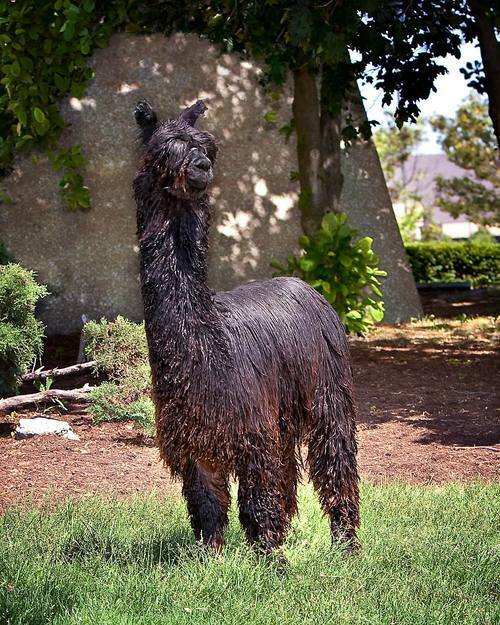 Balboa's sire is one of industry's top herd sires, DDF Peruvian Macgyver (now deceased). Olympia comes with a complimentary breeding to any Wild Rose Suri Ranch herd sire, along with 45 day board and a confirming ultrasound. Don't miss out on this one! 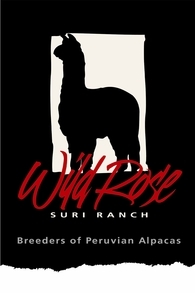 Her color background, fineness, and uniformity make her an excellent choice for a foundation dam to produce strong crias year after year. Contact Patti at 443-740-4240 or email us for more information. Offers welcome!